While a majority of voters in Glasgow and three other constituencies backed independence, the overall result was a defeat for the referendum by 55% to 45%, on a record-breaking 85% turnout. Saying he would respond complaints about London’s dominance, David Cameron said Scotland deserved more self-control, but so too did “England, Wales and Northern Ireland”. “We have heard the voice of Scotland and now the millions of voices of England must be heard,” the British prime minister added. Last night, as they have done for several nights this week, young Scottish nationalists gathered in the city centre George Square, maintaining the spirit of their positive campaign for national liberation. At around 8pm, however, a concerted mob of Union Jack-waving loyalists and fascists set upon them. Scottish flags were pulled from some of those present and set alight, while others were shoved and jostled. Sectarian and racist abuse was shouted at those present and passers-by. 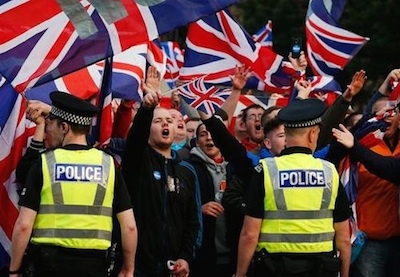 As police moved in, skinheads began making Nazi salutes and singing ‘Rule Britannia’. A number of people draped in union flags later left the area and spread to the nearby streets. One ‘Yes’ campaigner was reported to have been stabbed, while others were kicked and punched. The office of the Scottish Herald, the only local newspaper to support the ‘Yes’ campaign, was later targeted in an arson attack which damaged a generator at the rear of the building. There was anger in Glasgow last night at the failure of the police to prevent the loyalist mob violence. Suspicions about the actions of the authorities is already at a height after video evidence emerged which appeared to show votes being systematically ‘miscounted’ in at least two count centres. On online petition to demand a repeat ballot over these and other electoral irregularities has already gained 50,000 signatures. Meanwhile, it emerged that a pledge made to Scots that the Edinburgh parliament will get substantially increased powers will not be honoured by the British government until after a general election in May next year - which could render it meaningless. The promise of reform offered by Mr Cameron, Labour leader Ed Miliband and the Liberal Democrats’ Nick Clegg, in a pledge known as “The Vow”, is in danger of unravelling. In particular, the British Labour Party appeared determined to prevent any moves towards a federal-type union which could sharply lower its strength in the Westminster parliament. Miliband has said a full ‘United Kingdom’ constitutional convention should be set up after next year’s election. Every “nation and region” would have to be involved, he said, bringing together “MPs and councillors with ordinary citizens and civil society”, a process that could take years. Scotland’s first minister, Alex Salmond, who dramatically announced his resignation yesterday, warned that Scots would hold London’s “feet to the flames” to ensure promises are kept. Salmond was leader of the Scottish Nationalist Party, which led the ‘Yes’ campaign along with the Scottish Socialist Party and Green Party. In an emotional farewell after three decades as leader of the SNP, Salmond said that he was proud of the campaign and the record turnout for Thursday’s vote. The SNP deputy leader, Nicola Sturgeon, is his likely successor.